The aromas of cinnamon and nutmeg will have the family running to the kitchen for a holiday breakfast. In the bowl of a food processor, pulse together the almond flour, oat flour, coconut flour, salt, 1/2 teaspoon cinnamon, nutmeg, and brown sugar until combined. Add the oil and pulse until well combined. Transfer this mixture to a large bowl and set aside. For the topping, return ½ c of the flour mixture to the food processor. Add the pecans and additional 1/4 teaspoon cinnamon, and pulse a couple of times to combine and form loose crumbs. Add the eggs, vanilla and Silk Almond Nog Original and stir until smooth. Pour batter into the prepared pan. Sprinkle the pecan crumb mixture evenly over the top of the batter. Bake for 35-40 minutes. A toothpick inserted in the middle should come out clean, and it will not jiggle in the middle. 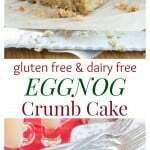 Cool the cake completely, and drizzle with the nog drizzle. Combine the sugar and Silk Almond Nog Original in a small bowl and stir until smooth.